(Coos Bay, Oregon) - The Egyptian Theatre in downtown Coos Bay is Oregon's latest entry in the National Register of Historic Places. Originally constructed in 1922 as the Motor Inn Garage and Service Station due to building restrictions in place after World War I, the building was transformed into the Egyptian Theatre after federal building restrictions were lifted. 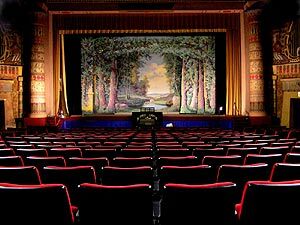 The theatre is historically unique in the preservation of its original décor in the Egyptian Revival style designed by architect Lee Arden Thomas and artist Carl F. Berg. The extensive Egyptian-themed interior decorations of the theatre consist of bronze pharaoh statues, columns painted with hieroglyphics and Egyptianesque characters, original light fixtures, furnishings, hand-painted vaudeville flats, and a Wurlitzer pipe organ. While there have been some alterations to the theatre's exterior, including the addition of a neon marquee during the early 1980s, the building's interior is essentially unchanged. The building still operates as a movie theatre. Oregon's State Advisory Committee on Historic Preservation recommended the building's nomination in February 2010. The Egyptian Theatre joins 20 other historic Coos Bay properties listed in the National Register, which is maintained by the National Park Service under the authority of the National Historic Preservation Act of 1966. More information about the National Register and recent Oregon listings is online at http://www.oregonheritage.org/ (click on "National Register" at left of page). In other Oregon tourism news, a tree thinning project will begin at a State Park near Klamath Falls and there will be forest health work being done at Silver Falls State Park near Silverton soon.